For those who celebrate this joyous holiday, Happy Lunar New Year!!! It`s going to be the year of the ram/sheep! It will officially start on Thursday, February 19th, this year. Growing up as a Chinese Asian American, it never occurred to me why my parents didn`t really give much thought to New Year on January 1st. I used to beg them to allow me to stay up so I can do the countdown with my sisters, but they said, it`s just another day. I guess, they`re not party people and people partayyy for New Year. Haha!! As rich and ancient as Chinese history goes, there are a lot of Chinese New Year traditions, which varies greatly depending on the location. Did you know, in China, people get like a whole week off (probably more) to celebrate the new year? I was totally shocked when I found out! I was like, uh, in America, only the 1st is considered a holiday. Of course, people celebrate only on New Year's Eve. Well, Chinese New Year is celebrated for 15 days. Can you imagine all the food and festivities going on throughout these 2 weeks? It must be crazy awesome. Okay, anyway, this mini cake has nothing to do with Chinese New Year. It`s NOT a traditional cake eaten during Chinese New Year, so don`t get confused. I leave all the traditional Chinese baking to my dad. Sometimes, I like playing around with some Chinese cake recipes, though. I made these months ago for my dad`s birthday because he loves Asian/Chinese cakes way more than the sweet "American" cakes you and I frequently eat. I thought, it`ll be a good opportunity to share an Asian recipe this week with the holiday. I`m not quite sure these cakes are even Chinese...but they`re very similar to the sponge cakes I`ve seen and eaten in Chinese bakeries. These cakes are not as sweet as say, vanilla or chocolate cakes baked in America, but they are sweet enough! Trust me! 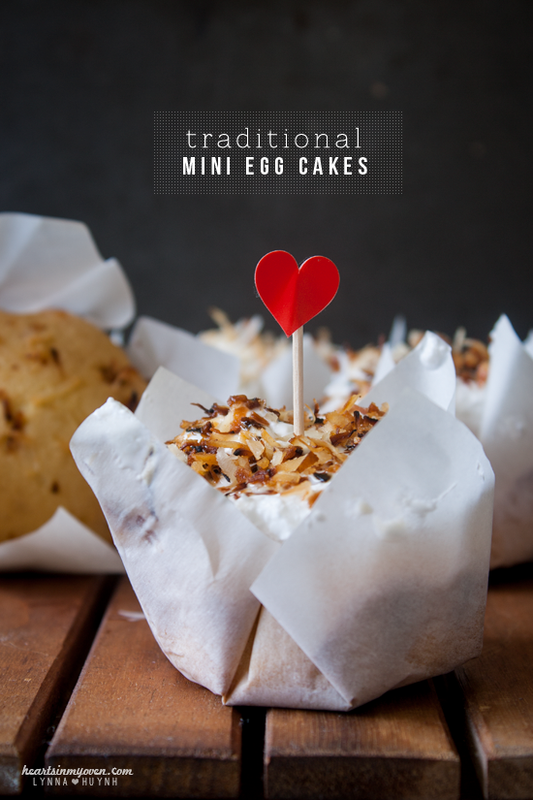 They`re perfect with tea, coffee, or an afternoon snack. My dad loves loves loves coconut, so I decided to quickly whip up some coconut whipped cream to top them off since it was his birthday after all (hence the heart sticker). Please, make this whipped cream. It`s simply amazing (along with this cake, of course). The best part? You don`t even need to add any sugar to make it taste good. I mean, you could add sugar...but you definitely don`t have to. My mom took a bite and was like, "Wow, why are you making such a good cake?!" I was like, "Uh, really, Mommy?" Haha! Okay, this post is probably all scattered and nothing probably makes sense with my train of thought on this whole post...but I`m heading off to bed now. I just really wanted to share with you all this recipe before tomorrow! 2. Whip eggs, sugar, and salt until light and fluffy. 4. Fold in dry ingredients (flour, etc). 5. Mix in the oil. 8. Remove from pan and allow to cool completely. 9. Take your coconut milk can out of the fridge. Flip it upside down. Open the can and remove the liquid. 10. In a bowl with electric mixer, add only the coconut milk and whip until fluffy. 11. 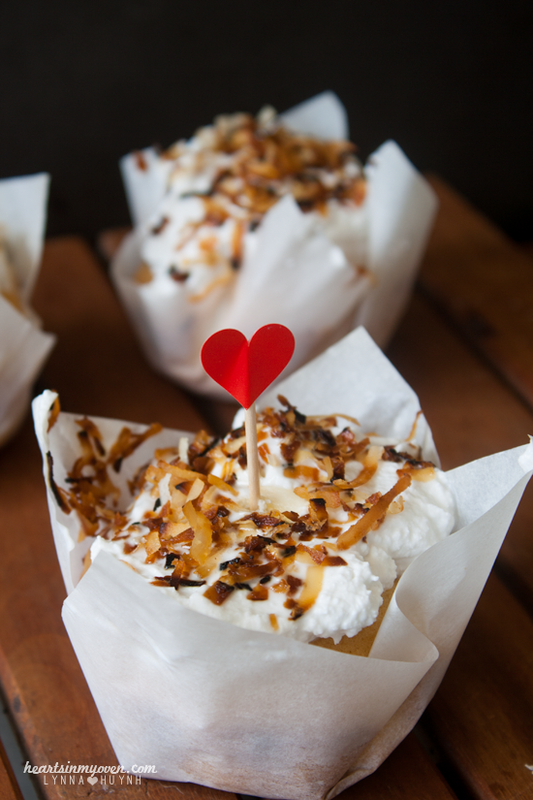 Top each mini cake with a dollop of whipped coconut cream and toasted coconut. - Toast coconut flakes on a skillet, no oil, just toss around until they turn golden. 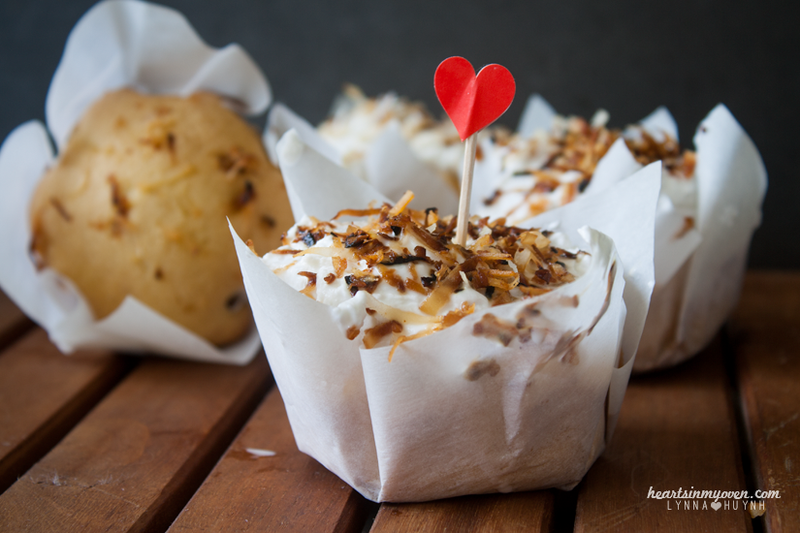 - Best to make the coconut whipped cream the day you are serving the cake.